19 E. Cayuga St. in Oswego was struck by lightning, causing a fire on the roof today. 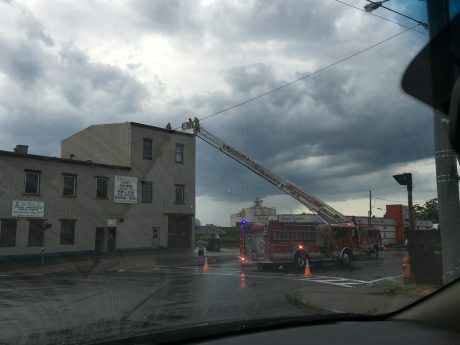 OSWEGO, NY – Oswego Fire Department personnel were notified at 3:24 p.m. today (Aug. 13) of a building located at 19 E. Cayuga St. struck by lightning. A customer of an adjacent business reported the strike to OFD officials after witnessing it and seeing smoke. OFD personnel responded to the structure, which is a large mixed occupancy containing multiple businesses, apartments, and storage areas. The Wet Paint Company and Zink Shirts are both located in the large commercial space. Firefighters surveyed the structure, looking for signs of heat or smoke, locating an active fire on the rooftop of the building in the northeast corner. The fire was quickly extinguished, and personnel went to work overhauling and searching for hot spots. Fire officials reported finding a 4″ hole in the roof, and a charred section of roof approximately 5 feet in length, which was removed. No injuries were reported, and damage was limited to a non-structural section of the roof. Fire officials deemed the structure safe for occupants, and released the scene. OFD personnel were back in service after approximately 45 minutes.